While searching for college scholarships earlier today I came across a fantastic program called SmarterBucks. 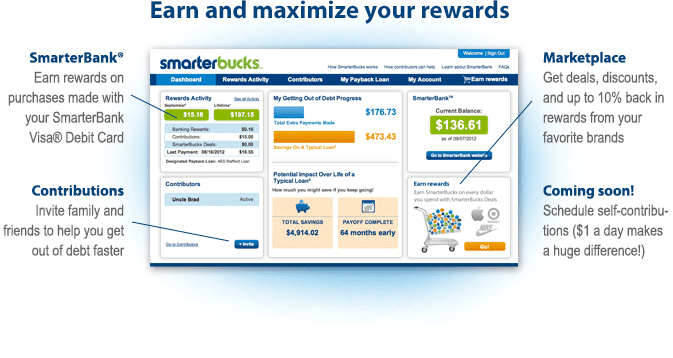 SmarterBucks is a reward program where you can earn cash back rewards simply by shopping your favorite online stores. Best of all is the rewards you earn are paid toward you student loan debt! You can also get a free checking account through their website and earn rewards on your purchases made with their Visa Debit card. I'm definitely going to be signing up for the debit card next! I've been using another reward program where you earn points to exchange for gift cards. Switching over to SmarterBucks and actually earning money that will pay off my student loan just makes more sense! They also offer a giveaway every month where you can win money towards paying off your loan. This month (January) they are giving away $2,500, so make sure you take advantage of this! Both students and parents of students can sign up through SmarterBucks. I must say I'm super excited for this new reward program!